have once again joined the challenge at SOUS (I once had a new years resolution to do that every week, but so far I have not been very good - but that is kind of normal when it comes to new years resolutions though so not feeling that guilty). Well... loved the sketch this week by Beggahua! Love the white spaces, and the multiple photo opportunities. Have once again digged deep in my library of pictures, with these cute photoes of Konstanse and her cousin picking blueberries in 2008. 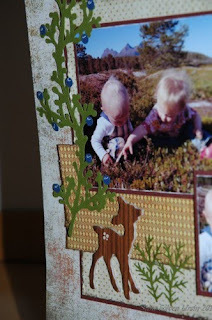 The blueberry "bush" is a cut from Storybook, cut as a border to make it longer. Title is once again Hello Kitty font Round feature - I love the simplicity of that font! 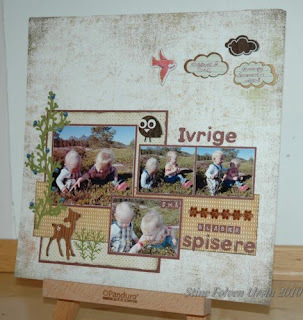 the title by the way means "Small eager blueberry eaters"
Stine, Great layout. Thanks for joining us this week! I am so glad to see something from you because I just LOVE your projects so much! I just think this is wonderful..I love how sweet this is and really, could it be any cuter? picking blueberries! And if you can't stand it Cody's 1st birthday is in 13 days! wow! soooo sooo fast! Så härliga färger och massor av vackra detaljer. Helt super!!! Älskar dina alster, alltid lika fina och välgjorda.